Tagisia Kilei, son of Kilei Tepuu and Sepoima Paulu, passed away suddenly while fishing on the ocean reef near his home in Funafuti. He leaves behind his loving wife Huao, and many children and grandchildren. Rest in peace Tagisia. 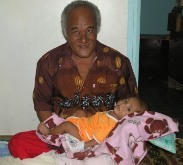 Ellaine Siliga Tala, daughter of Hetoifaiva and Neiaso, adopted daughter of Timi and Fakalepa, passed away in Auckland after a short illness. She leaves behind her loving husband Siliga, and a large family including Tavita, Tiopa, Penina, Lomani and others. 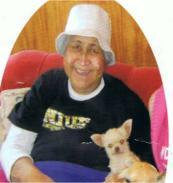 Rest in Peace Ella, Moe mo te Atua. 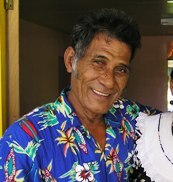 Manoa, beloved husband of Joyce M. Lilo, passed away in Suva after a serious illness. His family and many friends miss his smiling face and generous spirit. Rest in peace Manoa. Luseta Timaio (the wife of Timaio Saamu) passed away in Auckland, New Zealand on January 26th, 2010 after a long illness. Her funeral service, attended by large numbers of family members and friends, was held in Auckland on January 28th. Timaio and Luseta’s family, and the larger Nanumea family in New Zealand (as well as back in Nanumea) will miss Luseta dearly.